Posted in: Junior Tennis, Junior Tennis Champions Center, USTA. Tagged: 18s, Bellis, Boy's, california, carson, Catherine Cartan, CC, Frances, Francis, Girls, ISC, japan, junior tennis champions center, Maryland, Naoki Nakagawa, raveena kingsley, spring, Tiafoe, usta. And that’s exactly what the Bradenton, Fla., resident from Fukuoka, Japan, did on Sunday as he went the distance to beat top-seeded Francis Tiafoe to capture the Boys’ 18s singles title, 6-4, 2-6, 7-6 (5), on the final day at the 10th annual USTA International Spring Championships, an ITF level Grade 1 event played at the StubHub Center. “I was really tight but I knew I had to go for it,” said Nakagawa, who took a second serve from the forehand side for a cross-court winner to go up 6-5 in the breaker. He then hit a powerful serve down the “T” that Tiafoe could only manage to hit into the net. Tiafoe said he played an “unbelievable” game at 5-all to break Nakagawa’s serve and then had a chance to serve out the match. But Nakagawa returned some tough Tiafoe first serves to break back sending the match into a tiebreaker, the first time it’s gone that far in the event’s 10-year history. In fact, in the first nine Boys’ 18s finals before Sunday, only twice had a match gone to three sets. Nakagawa, 17, is in his fifth year training at IMG Bolettieri Academy in Bradenton, Fla. He calls current world ATP Tour Top 20 player Kei Nishikori a good friend. “Yeah, we train together and sometimes I go to his house and we play games,” said Nakagawa. In the girls’ 18s final contested at the same time, No. 5-seeded and 14-year-old CiCi Bellis of Atherton, Calif., made short work of 15-year-old and No. 9 Raveena Kingsley of Fulton, Md., 6-3, 6-0. Kingsley had beaten Bellis in their only prior meeting at the 12s USTA Spring Nationals back in 2011. Kingsley, who trains out of the Junior Tennis Champions Center in College Park, Md., had a tough three-set semifinal on Saturday and said she felt mentally and physically tired before the final. “And it’s my first Grade 1 final, so maybe that helped her confidence, that she’s been here before,” said Kingsley, who was coached by Frank Salazar all week. Bellis was cheered on by her hitting partner and one of her coaches Jelena Pandzic, a former junior prodigy from Split, Croatia, who reached as high as No. 135 in the WTA World Tour rankings. In 2012, Bellis was a finalist in the Girls’ 14s at the ASICS Easter and last year she won the Girls’ 16s. For a complete look at all the final draws, log onto the website at www.usta.com/isc. WHITE PLAINS, N.Y., August 12, 2013 – Unseeded Collin Altamirano (17, Yuba City, Calif.) and top-seeded Sachia Vickery (18, Hollywood, Fla.) captured the USTA Boys’ and Girls’ 18s National Championships single titles Sunday, each earning wild cards into the main draw of the US Open and headlining the annual USTA National Championships that took place last week. Vickery, the Girls’ 18s No. 1 seed, beat No. 2 seed Allie Kiick (18, Plantation, Fla.), 4-6, 6-2, 6-0, to win the Girls’ singles title in San Diego, Calif. Vickery and Kiick, the No. 2 doubles pair, teamed up to beat top-seeded Taylor Townsend (17, Chicago) and Gabby Andrews (16, Pomona, Calif.), 6-3, 6-4, for the Girls’ 18s doubles title and will now play together in the US Open doubles main draw. Vickery, No. 229 in the latest WTA rankings, has been as high as No. 6 in the ITF World Junior Rankings and trains at the USTA Training Center – Headquarters in Boca Raton, Fla. Kiick, the daughter of former Miami Dolphins running back Jim Kiick, won her second straight Girls’ 18s doubles title and also was appearing in the Girls’ 18s singles final for the second year in a row. Altamirano, currently No. 50 in the USTA Boys’ 18s National Standings, became the first unseeded player to win the USTA Boys’ 18s singles title in the tournament’s 71 years in Kalamazoo, Mich., defeating No. 14 seed Jared Donaldson (16, Cumberland, R.I.), 6-1, 6-2, 6-4. In the doubles final, No. 3 Ronnie Schneider (18, Bloomington, Ind.) and Paul Oosterbaan (17, Kalamazoo, Mich.) beat No. 4 Henry Craig (18, Murrieta, Calif.) and George Goldhoff (18, Irvine, Calif.), 7-6(4), 7-6(4), to claim the US Open doubles main draw wild card. In the Boys’ and Girls’ 16s singles finals, respectively, Tommy Paul (16, Coconut Creek, Fla.) and Katerina Stewart (16, Miami) each earned wild cards into the US Open Junior Championships with their singles victories. Paul, seeded third, beat No. 4 Jake DeVine (16, Boca Raton, Fla.), 6-3, 6-1, and Stewart, seeded second, beat No. 1 Ena Shibahara (15, Rancho Palos Verdes, Calif.), 6-4, 6-1. Complete results of the USTA National Championships can be found below. The complete draws are available at http://tennislink.usta.com. Singles: Collin Altamirano, Yuba City, Calif., d. (14) Jared Donaldson, Cumberland, R.I., 6-1, 6-2, 6-4. Doubles: (3) Ronnie Schneider, Bloomington, Ind., and Paul Oosterbaan, Kalamazoo, Mich., d. (4) Henry Craig, Murrieta, Calif., and George Goldhoff, Irvine, Calif., 7-6(4), 7-6(4). Singles: (1) Sachia Vickery, Hollywood, Fla., d. (2) Allie Kiick, Plantation, Fla., 4-6, 6-2, 6-0. Doubles: (2) Sachia Vickery, Hollywood, Fla., and Allie Kiick, Plantation, Fla., d. (1) Taylor Townsend, Chicago, and Gabrielle Andrews, Pomona, Calif., 6-3, 6-4. Singles: (3) Tommy Paul, Coconut Creek, Fla., d. (4) Jake DeVine, Boca Raton, Fla., 6-3, 6-1. Doubles: (11) Anudeep Kodali, Durham, N.C., and Taylor Fritz, Rancho Santa Fe, Calif., d. (1) Alex Rybakov, Coral Springs, Fla., and Tommy Paul, Coconut Creek, Fla., 6-4, 6-4. Singles: (2) Katerina Stewart, Miami, d. (1) Ena Shibahara, Rancho Palos Verdes, Calif., 6-4, 6-1. Doubles: (1) Ena Shibahara, Rancho Palos Verdes, Calif., and Savannah Slaysman, Phoenix, Ariz., d. (6) Francesca Dilorenzo, New Albany, Ohio, and Lauren Goodman, Fort Wayne, Ind., 7-5, 6-3. Singles: (15) Brian Cernoch, North Bethesda, Md., d. (2) Max Mendelsohn, Little Rock, Ark., 4-6, 6-1, 6-4. Doubles: (4) Alafia Ayeni, San Diego, Calif., and William Howells, Richmond, Va., d. (5) Roscoe Bellamy, Pacific Palisades, Calif., and Max Mendelsohn, Little Rock, Ark., 7-5, 2-0, ret. Singles: (2) Kayla Day, Santa Barbara, Calif., d. (1) Ashley Lahey, Boulder, Colo., 1-6, 6-3, 7-5. Doubles: (5) Anna Bright, Boca Raton, Fla., and Kariann Pierre-Louis, Miami, Fla., d. (9) Victoria Flores, Fort Dodge, Iowa, and Isabella Lorenzini, Clarendon Hills, Ill., 6-2, 2-6, 6-4. Singles: (1) Jenson Brooksby, Sacramento, Calif., d. (4) Thomas Yu, Bellevue, Wash., 6-3, 6-1. Doubles: (7) William Grant, Santa Barbara, Calif., and Garrett Johns, Atlanta, d. (6) Jenson Brooksby, Sacramento, Calif., and Scott Sculley, Churchville, Md., 7-5, 6-2. Singles: (1) Hurricane Tyra Black, Boca Raton, Fla., d. (2) Carson Branstine, Orange, Calif., 6-4, 6-2. Doubles: (2) Christina Hand, Moorestown, N.J., and Caty McNally, Cincinnati, Ohio, d. (7) Nicole Hammond, Centreville, Va., and Natasha Subhash, Fairfax, Va., 6-3, 6-7(2), 6-3. Weehawken, NJ (March 21, 2013) – Longines, the official timekeeper and partner of the French Open, announced today an expansion of their pioneering youth tennis initiative, Longines Future Tennis Aces – On the Road to the French Open, by partnering with the USTA Boys’ & Girls’ 12s National Spring Championships. As one of the nation’s most prestigious amateur tennis tournaments, the highest-ranked 256 players in the country will come to compete April 7-12, 2013 at the USTA Boys’ & Girls’ 12s National Spring Championships presented by Longines, hosted by the City of Delray Beach. The Spring Championships will serve as the U.S. qualifier for Longines Future Tennis Aces with the winner of the Boys 12s singles division earning a once-in-a-lifetime trip to Paris to play against qualifiers from 16 other nations. Participants must be born after June 1, 2000 to be eligible for the grand prize. Names of top-ranked athletes to compete will be announced at a later date. In addition to winning an all-expense-paid trip and the opportunity to play tennis in the center of Paris, the U.S. qualifier will compete to receive financing for his tennis equipment until his 16th birthday, courtesy of Longines. Longines looks to build upon the success of the program over the past three years. Previous Longines Future Tennis Aces U.S. qualifying tournaments took place at the USTA Billie Jean King National Tennis Center, site of the U.S. Open, in Flushing Meadows, N.Y., and included selected players from the USTA’s Eastern, Middle States, New England and Northern California sections. 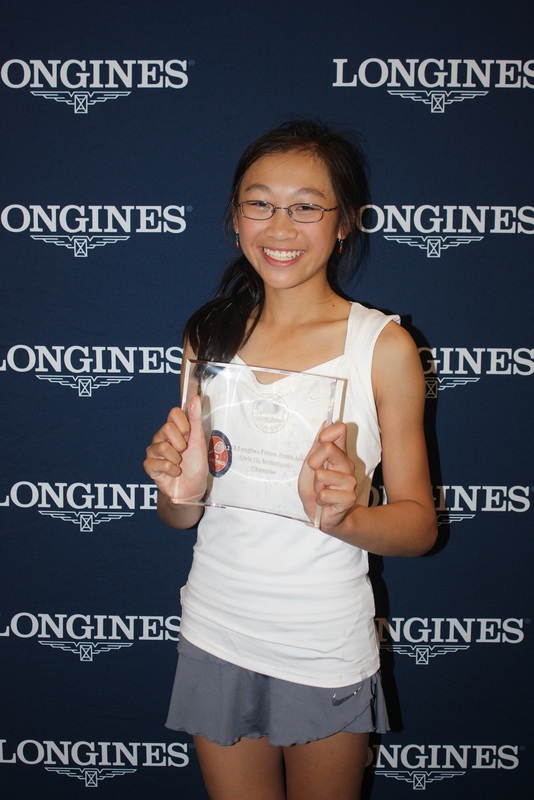 Rachel Lim of Briarcliff Manor, NY, won the Longines Future Tennis Aces qualifying event last year and represented the United States at Roland Garros, where she competed against 15 girls, 13-and-under from every corner of the world. Longines is the proud Official Partner and Timekeeper of the French Open at Roland-Garros since 2007. Longines Future Tennis Aces – On the Road to the French Open is part of Longines’ global commitment to support and develop tennis’ superstars of tomorrow. All the players who qualify for the tournament will have the opportunity to visit the red-clay courts of Roland Garros and attend a French Open match.